Are you struggling with how or where to start decorating a room? 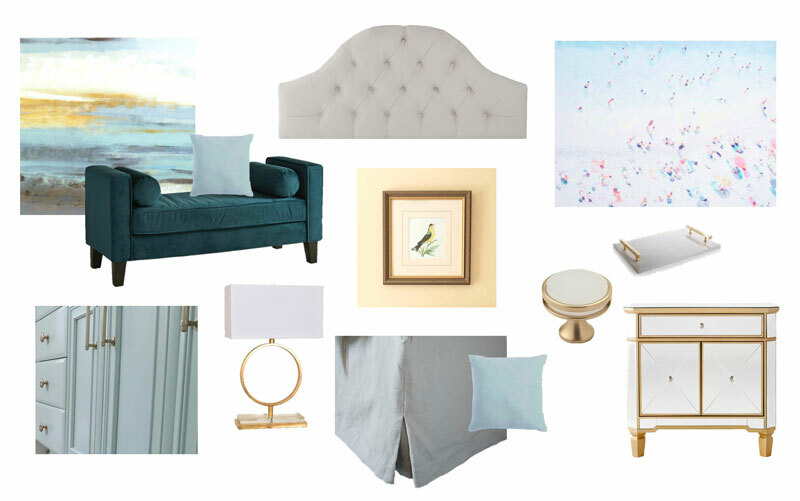 All it takes is one piece and a mood board to inspire a room makeover! Luckily, I like to keep things really simple when decorating or re-decorating. 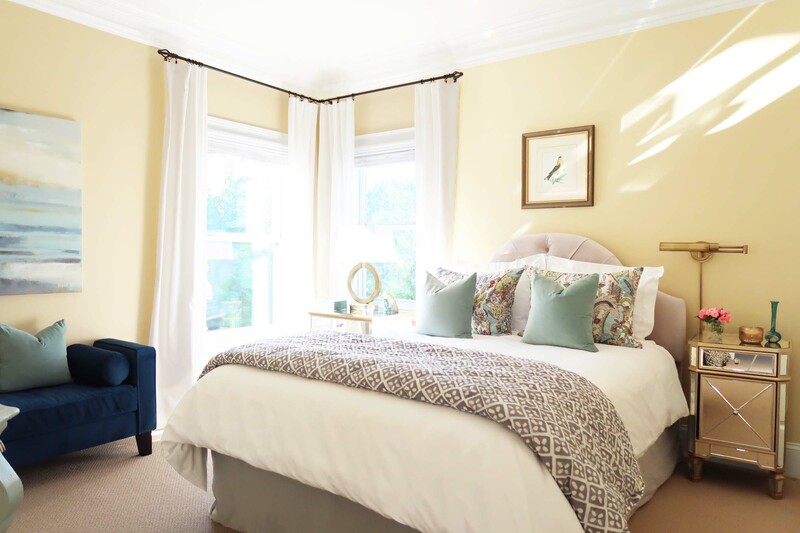 To help you in your room makeovers, I thought I’d share some easy strategies to use as you start a new design project. Rooms can be designed building off that one object. To help you understand the process, I thought I’d share my guest bedroom makeover because it was inspired by just one piece! 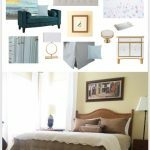 It helped me develop the room’s color palette and from there it became much easier to decide how the room was going to be decorated! Creating a mood board with of all of the items you are thinking about using can be EXTREMELY helpful! There are apps out there to help you, but I always just copy the photo and drop it right into a PowerPoint slide. Doing this has helped me avoid major mistakes (plus it’s free), before I make any purchases! 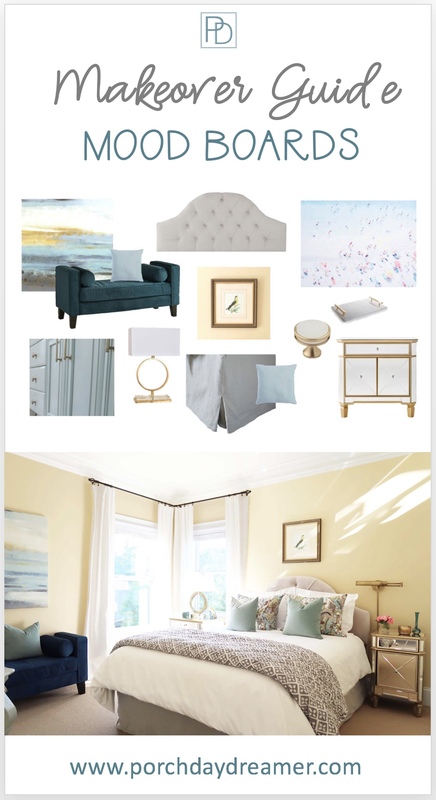 You can see how the color palette started to develop on this mood board as I put in the images of things I liked. I took a picture of the bird artwork I owned and dropped it into the slide. It showed me the wall color in the room that I could then build the makeover around. Seriously, other than your inspiration piece DON’T invest in any significant pieces without dropping your images in a document together – however you achieve this. If it’s an item you own and not online, take a picture and send it to your computer to insert into the board. Really, truly when I look at these pictures I can’t believe I lived with the guest bedroom like this for so many years. It was dark and the colors were just plain boring. 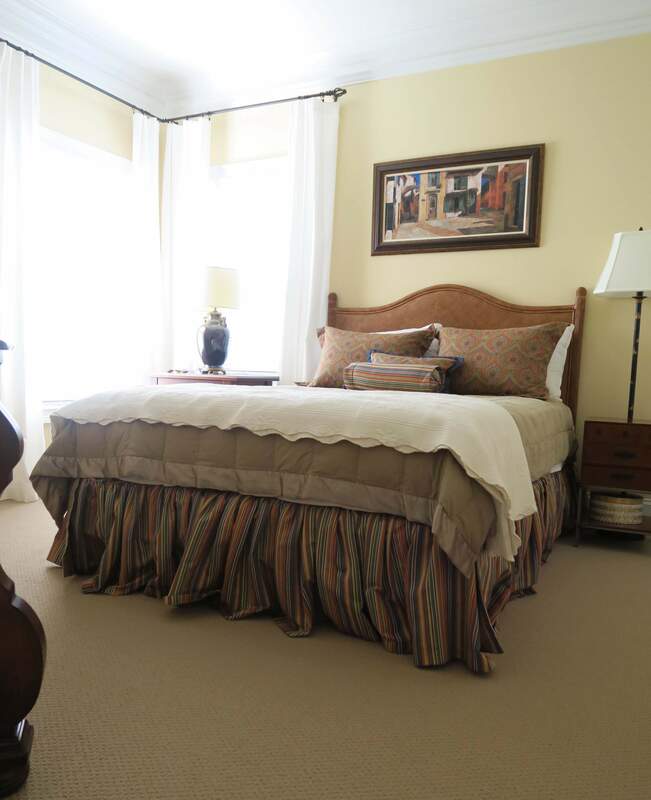 The bedroom was filled with items from old family rooms and bedrooms. The paint on the walls even looked ugly to me. Why did I pick yellow eight years ago? The room just wasn’t pretty in any way shape or form. There was potential though. Sunlight streams in from the east much of the day, the carpet was neutral, and the drapes were white. Yellow paint, well I could make it work some how because I didn’t want to tackle another paint job. A little bird tucked away in the attic. Yes, it was that simple finding one piece of artwork that I already owned. Trust me up until I found this little birdie the room makeover just dragged. Without any inspiration it felt too daunting to overcome the ugly! 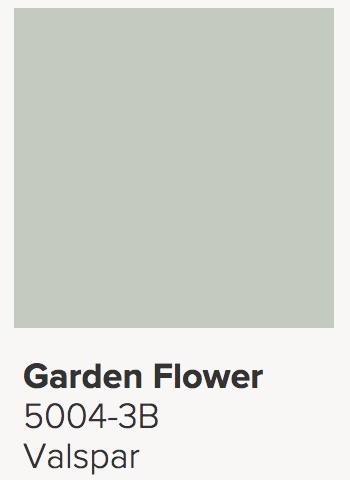 Developing the color palette is extremely important. It helps with the home textile selections and additional accessories. Pick up paint swatches and carry them with you when you are out running errands. Then you can always do a quick check to see if an accessory works with the colors in the room. If you aren’t sure how to pick out a wall paint color, I’ve developed an easy tutorial CLICK HERE. For the guest bedroom makeover I already had the wall color, drapes and carpet. Yellow, White and Sand were the base colors I HAD to work with and couldn’t change. Adding gray and shades of aqua from the bird artwork was just perfect! Luckily, I had some leftover cabinet enamel in a beautiful shade of aqua from my master bathroom makeover. If you want to see the transformation from an espresso stain to Garden Flower CLICK HERE. Repainting furniture to give a whole new look is one of my favorite and budget friendly things to do. 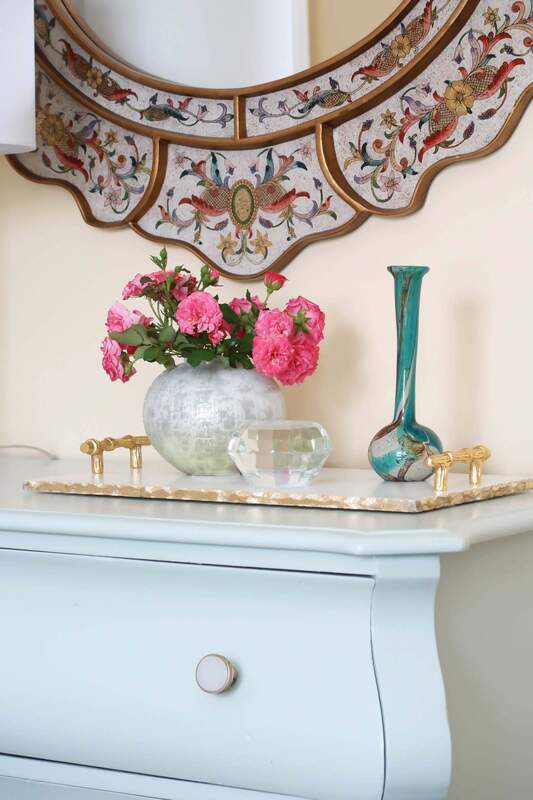 This room had a great Bombay chest in it that I had for over 20 years and it was screaming for an update! So it got a fresh coat of paint and some new hardware. 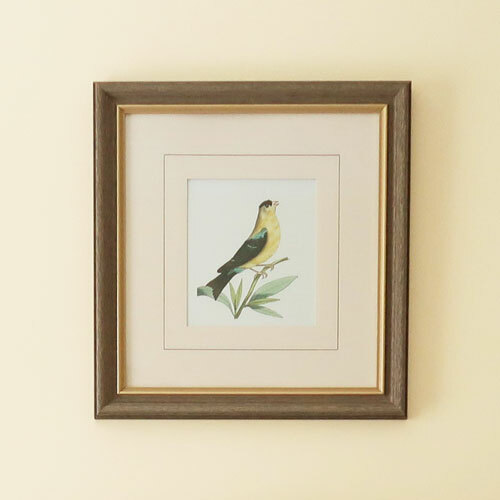 Let’s walk through all of the beautiful details around the room, so you can see how I blended the colors that kept pointing back to the bird artwork. A rare mid-stream view of the makeover and what the Bombay chest looked like before I painted it. Also, you can see how I mapped out how to hang two pieces of artwork next to the mirror (that was already in the room). 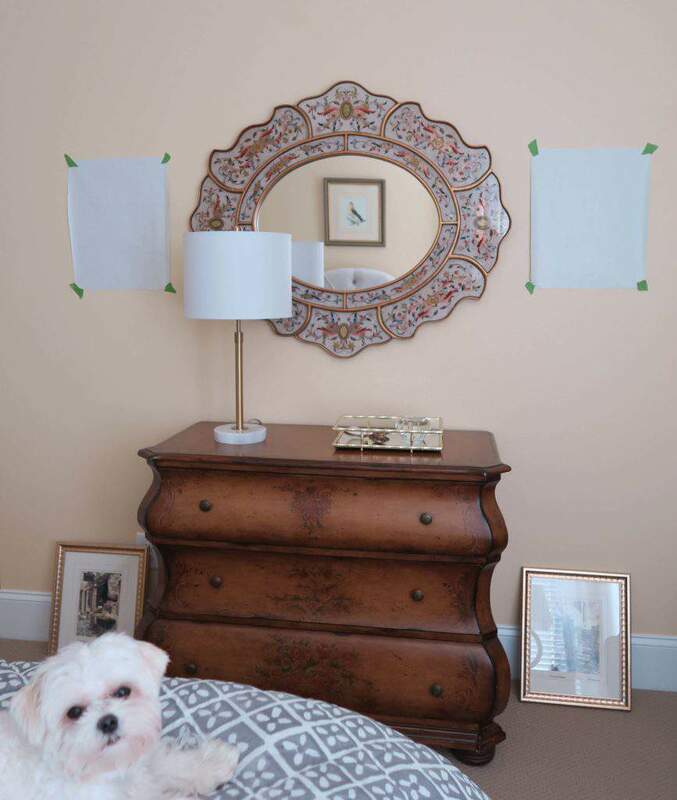 An easy trick is to trace the frames on wrapping paper and tape up with painter’s tape. Now the Bombay Chest is alive again with a brand new color Valspar (at Lowe’s) 5004-3B Garden Flower and modern gold and white hardware. ANOTHER one of my favorite budget friendly ways to update cabinets and furniture. 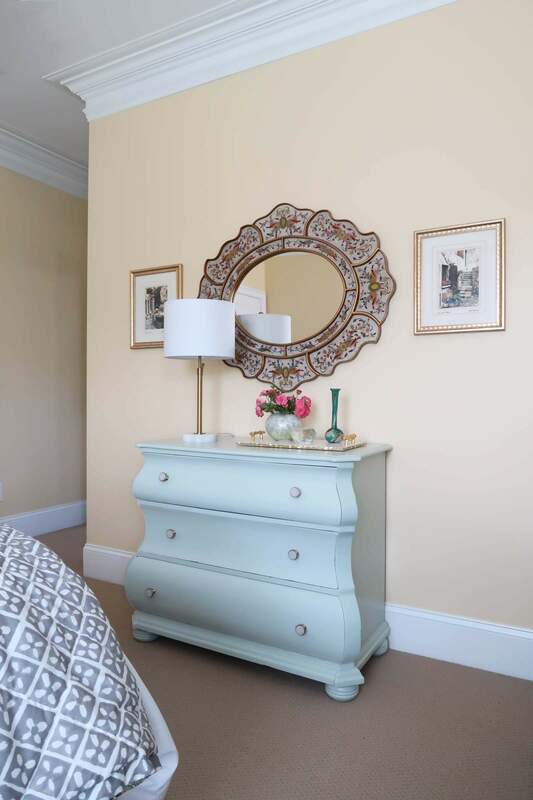 The chest looks like a completely new piece of furniture and I was able to repurpose a mirror and small pieces of artwork to make a more substantial grouping on the wall. Plus the mirror helped tie all of the room colors together on the wall opposite the bed. Guests LOVE having a place outside of the bathroom to get ready: dry their hair, put on their makeup, and get dressed. It helps having a mirror over a chest especially when you have two guest sharing the same bathroom. Another item that was important and one of the FIRST items on the mood board was a bench. The room is fairly small, so I had to search for something small AND comfortable. 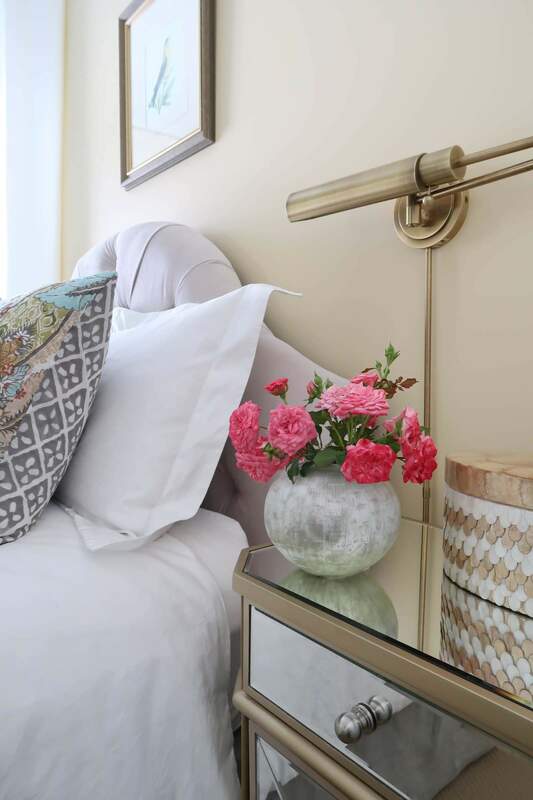 Having a place to set things on other than the bed or a place to sit and put on your shoes was a nice addition to this guest bedroom. This bench is SO comfy with the two roll pillows. 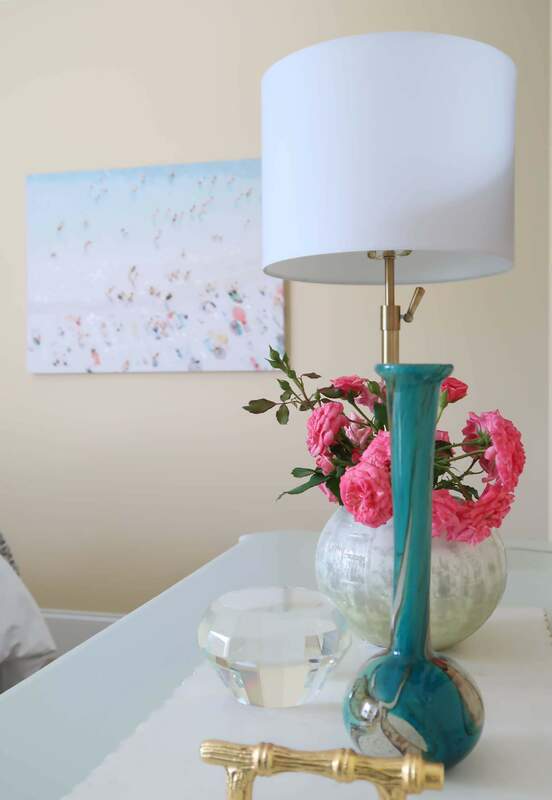 The coastal artwork was a great and inexpensive find that defines this small space in the room. Previously this wall was a little bit of nothing. Now a vignette draws you into the corner. 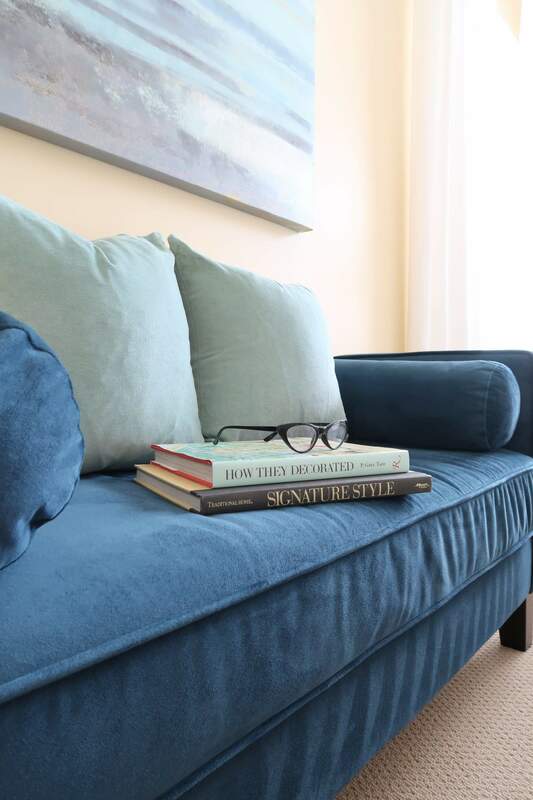 Luckily, I was able to find aqua velvet pillows to pull in the same color of the chest and used those on the bed as well! One of my favorite looks is upholstered headboards, so that was the first piece of furniture I search for and purchased. The prices have become so affordable that after this makeover I added one to the master bedroom as well. 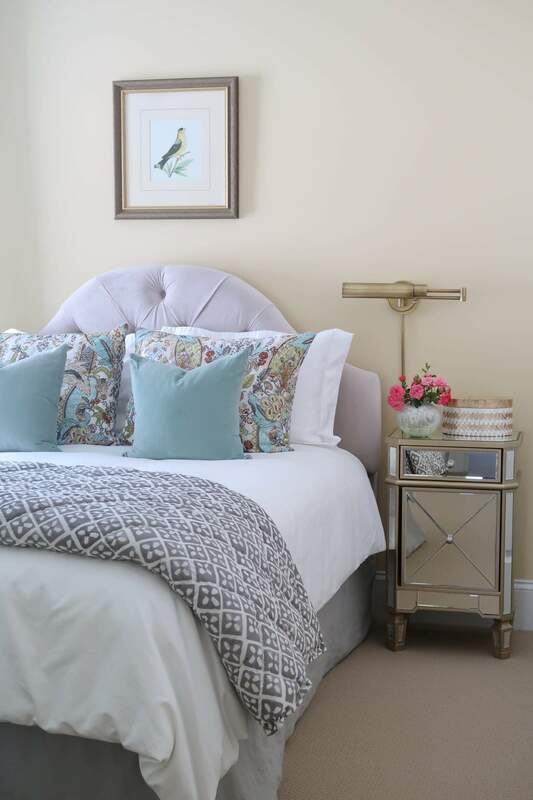 The dove gray velvet is a nice accent to the yellow wall making it appear more neutral. The bedding was a fun find (on sale) at World Market that had all of the same room colors that ties everything together. Sorry, it’s no longer available! To unite the headboard with something else in the room, the bedskirt is also in gray, along with the bedding at the foot of the bed. 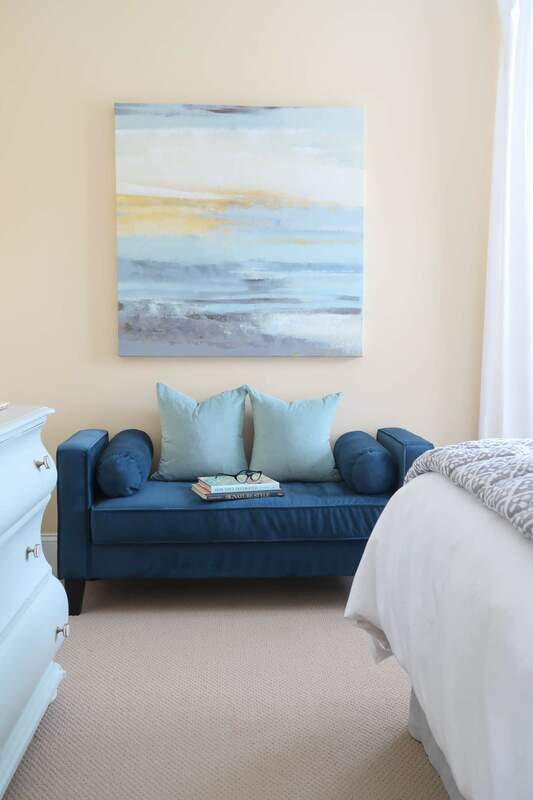 Yellow and gray is always a nice combination, but what made this room truly look new and fresh are the punches of aqua and teal. Mirrored furniture is amazing because it can brighten a dark corner and it doesn’t compete, but instead complements the room. 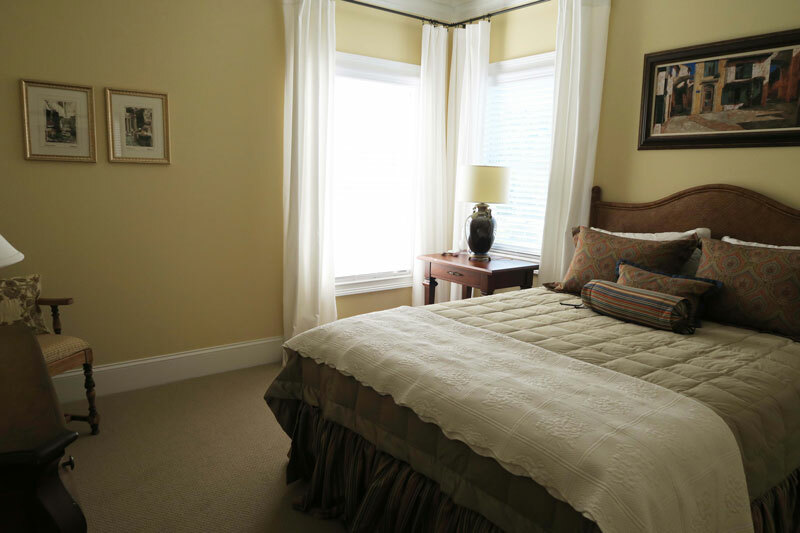 The wall on the right side is very narrow so I went with a smaller nightstand on one side, with a swing arm lamp for lighting, so the guest sleeping on that side has room to put a book or glass of water. If the roses are in season, I’ll add them to the room too. Fresh flowers are always appreciated by my guests 🙂 Previously, all that was here was a tall floor lamp – not very useful! 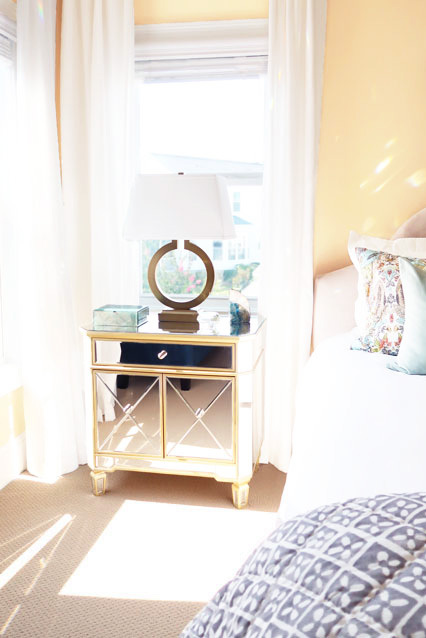 See how the sunlight BOUNCES off of the mirrored nightstand on a sunny day? I just love coming in here in the mornings to tidy up and make the bed, after guests leave. Then the BEST find was a few little trinkets from Home Goods to pull in the teal and luckily a circle lamp with a rectangular shade. The rectangular shade takes up less space visually in the room and I love the graphic look the circle provides as you look through the window. 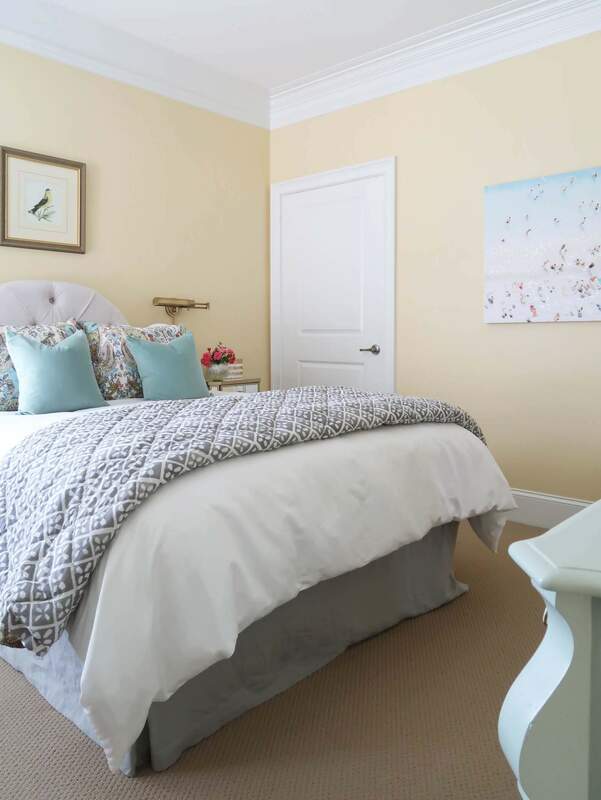 Do you see how a simple base of yellow, sand, and white with a little birdie artwork led to a fun and fairly easy makeover? Here is the before…crazy right? It makes me appreciate what a big change it truly was! Hopefully, I’ve helped you understand how to start a makeover and believe a mood board is one of the BEST options. Is this my favorite room in the house? No, but it’s SO much better than before that it’s hard to believe. 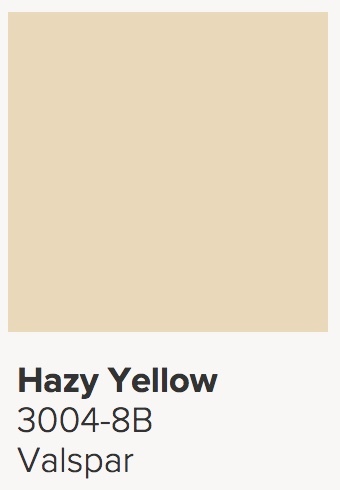 Will I likely paint these walls because the yellow drives me a little crazy? Yes, definitely. What is so nice is that I have a neutral base to work from and can easily update this room. My next little project will be to update the curtain rods – they got skipped the first go around to save a few bucks! I think I may have a set in gold leftover from my dining room makeover. Shop your attic friends! 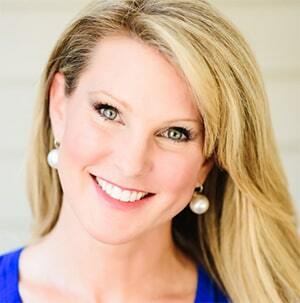 Please stay in touch by subscribing to my weekly newsletter! The room looks so much lighter and brighter! That mirror is spectacular! Thanks so much! I love the new look too. Your makeover is gorgeous. 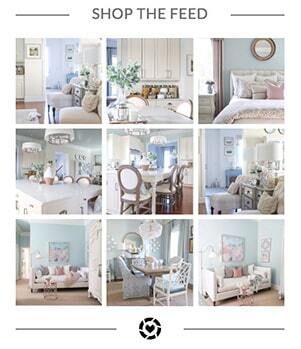 Such a great post and so helpful in how to transform a room. Marty, You made my day! Glad it was helpful and thanks for taking the time to let me know!